The concept of a scheme involving placing commemorative plaques on what was once the homes of notable people was first raised by MP William Ewart in 1863 in Parliament. Three years later, in 1866, the idea was adopted by the then Society of Arts (later the Royal Society of Arts) and in 1867 it erected two blue plaques, the first being one commemorating the birthplace of Lord Byron at 24 Holles Street just south of Cavendish Square in Marylebone and the second being that erected to Emperor Napoleon III in King Street (see last week’s post). But the Byron plaque had the honour of being the first and it remained on the property until it was demolished in 1889 and the plaque, presumably, lost. It has, however, been replaced several times on subsequent buildings on the site – the latest incarnation, is a “green plaque” erected by Westminster City Council on what is now a John Lewis store and was unveiled on National Poetry Day in 2012 (it replaced a non-standard, rectangular-shaped plaque – pictured above – which was installed after the building was bombed during World War II). 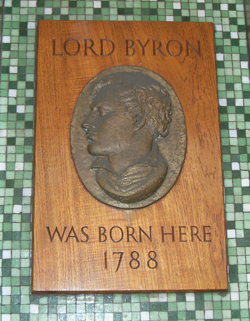 Byron is said to have been born at the property on 22nd January, 1788 and was baptised George Gordon Byron at the nearby St Marylebone Parish Church. Interestingly, English Heritage says that recent research has shown there is no clear evidence for which house in Holles Street Lord Byron actually lived in meaning none of the plaques may have actually marked the correct site. During the first 35 years of the scheme’s existence it erected on some 35 plaques (there are now some 900 in existence, so the pace has quickened since). Less than half of them now survive but among those that do are plaques to poet John Keats (erected in 1896 on Keats’ House in Hampstead), novelist William Makepeace Thackeray (erected in 1887 on 2 Palace Green in Kensington) and politician and author Edmund Burke (erected in 1876 on 37 Gerrard Street in Soho.